In the first line of the Petition, provide your current legal name. Provide the same name in part 1. In part 2, provide your date of birth include month, day, and year. 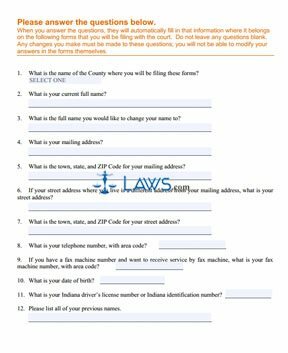 In part 3, provide your driver’s license number of Indiana identification card number. In part 4, provide your mailing address. If your residence address is different, provide the separate address below as well. If you’ve had different names in the past, provide these names in part 5. Leave the section blank if you had no previous names. In part 6, provide a form of identification that you will bring with your to the hearing in order to prove you’re a US citizen. A birth certificate or social security card will suffice. In part 7, you need to state that you have never been convicted of a felony. You cannot apply for a name change if you’ve been convicted of a felony in the state of Indiana or the United States. In part 11, state your reasons for wanting to change your name. In part 12, provide your new name. Sign the form in front of Circuit Court Clerk. After completing the rest of the forms, make copies of all the forms and bring the forms to the Circuit Clerk. There will be filing fees, and these fees will range from district to district. You need to publish the Notice in a local newspaper for at least 3 consecutive weeks, and the last publication must be at least 30 days before the hearing.